I sent the photos of the portraits via mail to my clients some days ago and these two Dutch kiddies have been approved by their proud grand-parents now. I received a very nice mail from them, expressing their happiness and gratitude about my work. 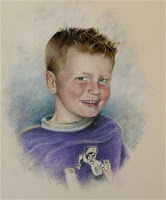 When you get such compliments, really, however much you have suffered before and doubted your aptitude as a portrait painter –and this was the case this time by one of the boys, believe me! Kevin saved the poor innocent boy more than once from the garbage bin!- you forget all that pain and just feel deeply fullfilled to have given your clients such happiness. I never experienced in my life, in other domains where I worked such a feeling to have been „useful“, to have something important to give to humanity. I don´t know if I told you before, but my first profession is mathematician. I initially worked teaching younger students mathematics in the University and later on, in the industry as a consultant resolving inner structural and financial problems of companies in trouble. Even if I know that what I did was very useful, for the students as well as for the companies, I never felt so inwardly accomplished as when I create a portrait which make my clients happy. This is especially true of portraits. 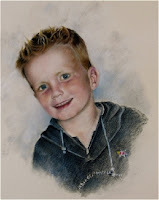 I already made a lot of paintings on commission –landscapes, sport scenes, flowers, animals, etc...- but the satisfaction is never so deep as with portraits. Honestly: I have no idea! Anyway: in life the satisfaction we get from some work done is always proportional to the inner effort we had to do to achieve it, isn´t it so? And everybody knows it: portraiting is quite a hard task! So lets hope I´ll always have occasion to make this special gift to humanity... well, I know, it is a special kind of gift as it is not quite free of charges, but I am sure you will forgive me!